Help fight for the land you live in, freedom of speech, our own sovereignty (no EU meddling), stronger defence, strong curbs on immigration, abolition or greater controls of the Human Rights Act, and putting the rights of our legal and law abiding citizens first, etc.etc. Our Health and Safety laws need some changes as well. Don't just say you'd like to see these things happen, do something about it ! You can make a difference by joining the KnightsTemplar.org.uk. Whilst the others play and dress up at being Knights Templars, we do the business. We at the KnightsTemplar.org.uk do not condone violence towards any religion and should any of our members be found guilty of such offences, they will be immediately banned from membership. We fight the fight, by way of persuasion, voting tactics, peaceful protest and petitions. Making democracy work involves give and take from everyone but as we see on the daily basis there's less take and far too much giving from our point of view and we are made to feel more like second clas citizens in our own country. This not just a challenge for Christians it is a challenge for us all and we are finding constructive ways of dealing with it. A superb professional A4 certificate on real parchment for you to frame. Be proud to display to those around you, that you belong to an organisation that puts your rights and theirs, first ! Access to our MEMBERS ONLY Facebook page. A monthly newsletter sent to you by email giving latest news, meetings, petitions appertaining to our cause, photo's and a bit of fun too ! Should you require it at any time, you will have access to our Chaplaincy service, with our Official Knights Templar Chaplain. Dont forget £5 of every membership goes towards a worthy charity. (Please see our page "Charities and causes we've helped so far to date). To join our organisation and show that you care about what happens to Great Britain and the British way of life, our membership is a one time fee of only £25. Yes that's right, just £25, no yearly renewals and no catches. £5 of the membership fee goes directly to funding charities, causes that we hold dear to our hearts. Such as Veterans, homeless etc, In fact our brothers and sisters help decide where we would like the monies to be distributed. To join, please read our terms of membership and click the 'I Want to Join' button. Once submitted you'll be able to make your membership payment through our secure server at PayPal. NB. By using the PayPal Guest Account this allows secure payment for visa/debit/credit cards please make sure you have entered your address and e-mail so you receive all of the Knights Templar benefits. Up on joining, the email address we use to communicate with you is the one linked to your paypal account or the one you are asked to input when using your credit/debit card. If this is not your primary email address, please let us know an alternative one, via our Contact Us facility. By clicking the 'Yes I want to join' button, it means you have read and agree with the terms of membership. "The original Knights Templar were formed to protect the rights of Christians. 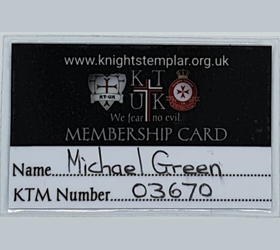 At Knights Templar Organisation-UK we broaden that, to protect the rights of all lawful religions and belief systems from the extremists of any religion. We believe that anyone has the right to follow their particular faith or philosophy, (to include atheists) so long as it does not infringe the rights of others faiths or philosophies or cause them harm. We seek to help all lawful belief systems, atheists and nationalities, to peacefully co-exist without hindrance. We do not condone or encourage any unlawful or extremist acts, hate speech or violence towards any religion or Race and will actively support peaceful and lawful means, to prevent such events occurring. " We are not a front for far right groups/parties or people. We have no connection with any other Templar Orders. 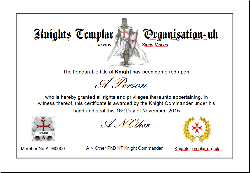 If an applicant is granted the right to join Knights Templar Organisation UK, the honorary title of Knight or Dame within our organisation will be conferred upon them. The successful applicant may use KT-UK or KT as a suffix to their name. It is a requirement to acknowledge all emails and newsletters. A minimum "Received" will suffice. If a Knight or Dame is proved to be in violation of these terms hereto laid out, or attempts to harm or undermine our order in anyway, then at the discretion of the Grand Master only, such Knight or Dame may have their membership withdrawn. In all matters and business, relating to Knights Templar Organisation UK, the decision of the Grand Master, is final. By clicking the 'Yes I want to join' button, you formally agree to the above terms and conditions and agree to honour the authority of the Grand Master in all matters.